There’s a road trip waiting for you, regardless of where you find yourself in the US. The only question is where do you want to go? Many people know the Appalachian Trail because of the hard work and many miles it takes to complete this daunting hike, however, if you want to do the AT but not spend weeks in a tent, just do it in your RV! Just as sure as the AT exists as a trail, it also exists as an excellent road trip. Let’s take a look at the Appalachian Trail Road trip including the best places to stop, where to stay and some other tips for getting the most out of your trip. For our AT road trip we won’t quite be knocking out the entirety of the trail but starting a little bit further south by making our north terminus Mt. Washington in northern New Hampshire before ending at the south terminus in Atlanta, Georgia. You’ll be winding your way through dense forests, rolling hills and a little urban metropolis. This is definitely a road trip for outdoors-minded RVers and those who like classic two-lane scenic drives. Let’s take an in-depth look at the trip. You kick off your trip in the beautiful White Mountains of New Hampshire at Timberland Campground in Shelburne. Timberland is big rig friendly with open shaded sites and each of those sites coming with full utility hookups including both 30 and 50 amp hookups. On top of that, you also get cable and satellite hookups in some sites and a picnic table and fire pit at all sites. Timberland also has showers and laundry facilities available for your use. Other fun facilities at Timberland include a general store, pirate ship playground, heated pool and kayak rental just to name a few. The White Mountains area is perfect for outdoors lovers. You can try hiking to the peak of nearby Mt. Washington or if you aren’t up for the hike, simply take the Cog Railway to the summit. The White Mountains are also good for mountain biking, kayaking, whitewater rafting, geocaching and other outdoor activities. The kids will likely enjoy the local theme parks such as Story Land or Whale’s Tail Water Park. There’s more than plenty to do at Timberland Campground and Shelburne. Hidden Valley Campground is situated in western Massachusetts and has plenty of amenities and facilities for your road trip. All sites are shaded, private and come with full utility hookups. You can clean both you and your clothes in the shower and laundry facilities after enjoying some of the camp’s amenities such as live entertainment, a rec hall, horseshoes, potluck suppers and more. Our next stop comes for one main reason, the lovely Berkshires of western Massachusetts. Spend your days exploring the lovely countryside by bike or foot. Some of the more popular attractions in the Berkshires include Bousquet Mountain, the Canoe Meadows Wildlife Sanctuary, and Lake Onota. There are also wine tastings at Balderdash Cellars, shows at the Colonial Theatre and Barrington Stage Company while the Berkshire Museum will teach you some new things. Like your first couple stops, Mountain Vista Campground is a forested park surrounded by fun. You’ll have your basic amenities such as full utility hookups along with laundry and shower facilities to get you started. The fun amenities and facilities at Mountain Vista seem limitless. You have your choice of gemstone mining, hand-dipped ice cream, bocce, basketball, a playground and tennis court for starters. Mountain Vista is an excellent campground if you have little ones. Mountain Vista Campground and East Stroudsburg, Pennslyvania are meccas for outdoor activity due to both the Pocono Mountains and the Delaware Water Gap running nearby, leaving you with tons of outdoor fun. Hot spots include the Delaware Water Gap National Recreation Area, the Appalachian Trail itself and Bushkill Falls. The local area includes plenty to do other than just outdoor activities, you have flea markets, a casino, wineries and even skydiving just for a taste. You might find yourself at this stop for several days before moving on. Pit Stop: Washington, DC to see the nation’s Capitol. There are a few nice places to stay in the local area but Endless Caverns Resort is among the best. You get your creature comforts with full utility hookups and a recently remodeled bathhouse and laundry facilities to keep you clean. There some fun amenities right at the park such a playground, swimming pool, rec hall, game room, catch-and-release fishing and more. Visits to Endless Caverns Resort comes with a guided tour of the beautiful caverns themselves, surefire crowd pleaser. The local area is full of history as well with many historical sites such as the Virginia Museum of the Civil War, New Market State Historical Park with plenty of other civil war-minded attractions in nearby Harrisonburg. Not to mention you’re on the backdoor of Shenandoah National Park. 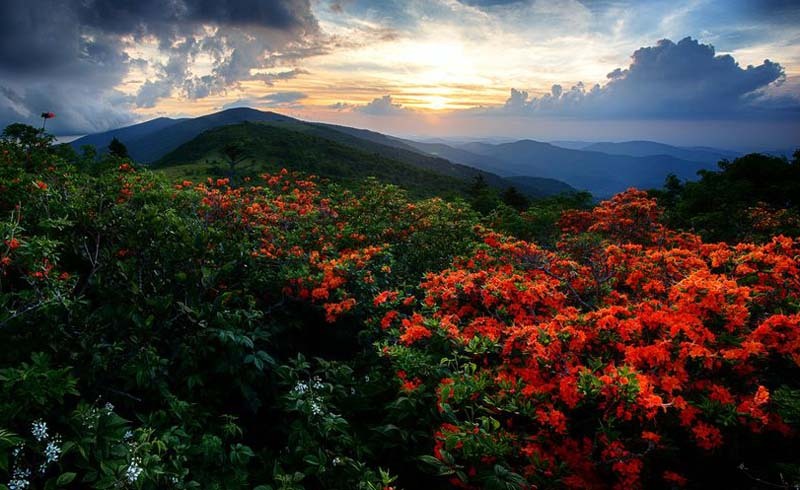 Pit Stop: Blue Ridge Parkway for one of the most scenic drives in all of the United States. Campfire Lodgings is an absolutely gorgeous RV park that’s already been featured once on our site as part of North Carolina’s best RV parks and it’s still a fantastic park. All sites come with your choice of 20, 30 or 50 amp electrical in addition to water and sewer utilities and you have a choice of site such as mountaintop or premium sites. There may not be a lot of superfluous facilities such as arcade rooms but the park does boast clean and bright shower and laundry facilities as well as a dog park and onsite fishing. Like East Stroudsburg earlier, Asheville is another staple of fun for the outdoor community. You have hiking, biking, geocaching, rock climbing, mountaineering, kayaking, whitewater rafting and plenty more in the surrounding wilderness areas. Many people also flock to Asheville for tours of the grand Biltmore Estate and Gardens as well. Asheville is a town where you can have plenty of fun just walking around so try to hit up some locals for secret hot spots for food and drink. You’re a few miles outside the heart of Atlanta but trust me, you don’t want to be RVing in Atlanta anyway. Stone Mountain Park Campground lies in the shadow of one of the greatest stone carvings in all of America and has some amenities to boot. There are different types of sites depending on your needs but you’ll have no problem finding a site with all three major utility hookups. The comfort stations come with new and clean showers and laundry facilities and grills, picnic tables and fire rings dot the park for your use. On top of all that you have free Wi-Fi and cable, a general store, a playground and much more. Atlanta is one of the largest cities in the United States so there’s something for just about everyone. You can start with the attractions right at the RV park but we also recommend getting into the heart of the city for fun as well. You can check out the College Football Hall of Fame, Centennial Olympic Park, the World of Coca-Cola or the Martin Luther King Jr. National Historic Site. That’s just a taste of the Atlanta fun and no Atlanta trip would be complete without a trip to the Georgia Aquarium, the largest aquarium in the western hemisphere. If you are fine with cooler temperatures for part of your trip, the best time to go would be during the fall. 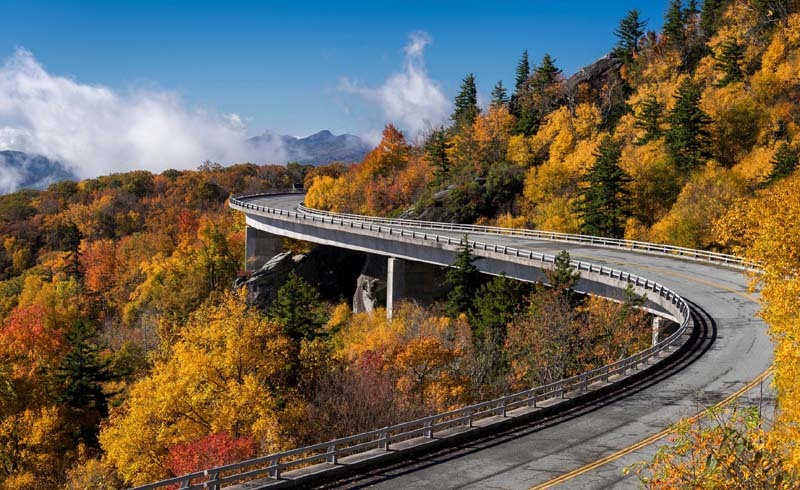 This should be considered a fall trip due to the brilliant colors that will line much of your routes like in the White Mountains, the Berkshires, Blue Ridge Parkway and more. It also doesn’t hurt that you will get much more pleasant weather in the southern portion of your trip during the fall. So if the Appalachian Trail seems like your ideal vacation but you don’t feel like hiking hundreds of mile, you can try the Appalachian Trail road trip instead. The combination of brilliant colors, rolling hills, and scenic drives makes this a great American road trip.